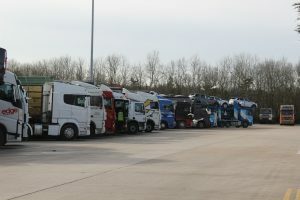 Lymm truckstop – formerly known as the Poplar 2000 – is a strange hybrid between a truck-friendly place to stay and a car-friendly motorway services and hence it has some good things for truck drivers and many not so good things. There is no doubting it has the facilities – toilets, showers, a barber’s shop, fuel, truck wash, shop for truck accessories, adblue and gas oil, but the fact there is enough to tempt the families in their cars means two things – a conflict of interest and also inflated prices. Admittedly most of the familes will head for the Greggs, McDonald’s drive thru, Costa Express and Krispy Kreme outlets, but it does mean the site can get very congested. That said, there’s nothing stopping trucks drivers using the McDonald’s, Krispy Kreme and other establishments. But don’t forget your wallet if you do so! But Lymm must be doing something right given the amount of trucks parked there on a Friday morning. The place was positively rammed. 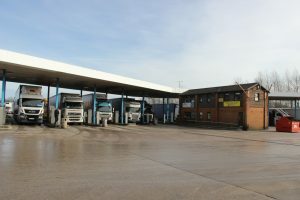 The standard fayre that truck drivers traditionally appreciate is generally well catered for, but it’s not especially cheap, and it’s not the best quality when compared with more out of town, bespoke truckstops. It’s not bad, but it’s nothing to write home about. For example, a bacon or sausage bap is £3.49 and to add an egg to either will add another 99p to your bill. 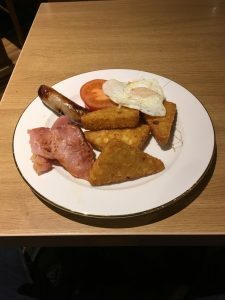 A traditional breakfast is £5.99 – and comprises bacon, sausage, eggs – fried or scrambled – hash browns, beans and half a tomato, but toast and tea or coffee is extra on top of that. In fairness, they offer substitutions, so I was able to change beans for extra hash browns. The Full English is another pound and is the same but also include an extra sausage, mushrooms and black pudding. Any extra item is £1.49. To add two slices of toast is another £1.99. Tea, or Earl Grey, is £2.29 while an American is also £2.29 but a latte cappuccino or hot chocolate is £2.99. So a Full English, with toast and a coffee will be the best part of £12! Cereals or porridge are £1.89 and a kids’ breakfast is £2.99 for sausage, egg, beans and toast. The main meals offered in the Fifth Wheel bar and grille are the usual Burgers, curry, chicken, steak and chips, mixed grille and so on. The burgers start at £7.99 for a beef burger and go up to £9.99 for a double burger. The vegetarian nacho burger is £6.99. Small platters starts are £3.99 each or three for a tenner. The choice is limited compared with other establishments. Deserts start at £1.99 for vanilla ice cream and go up to £2.99 for Mississippi mud pie. Parking is free for up to two hours and over that – up to 24 hours is £18.50. Trailer changeovers have a charge of £3 for 24 hours. Prices are paid using pay points in the main building and the fees are strictly enforced by CP Plus. There is parking for up to 600 trucks, so it’s usually easy to get a slot. For any driver wishing to sleep away from their cab, there is Ibis Budget hotel at the site and although prices vary for this, expect to pay in the region of £45 should you so desire. 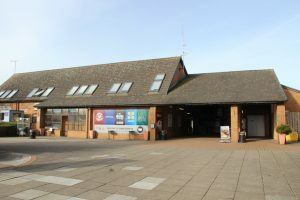 As well as the fast food and coffee outlets, there are also a Marks and Spencers and WH Smith selling snacks, sweets, drinks and, in the case of the latter, magazines and newspapers. 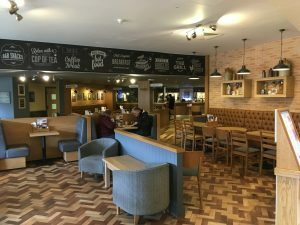 Like most motorway services, however, the prices charged for snacks in these establishments is a lot more than you would pay in the high street. The site was clean, and the dining area in the café especially was very nice. That said, outside there was a mass of cigarette butts thrown on the floor which is always bad to see. The food quality was acceptable, but nothing to shout about, and it was expensive. The staff were friendly enough and they cleared the table fairly promptly, although at the time of my visits I have to say, they seemed somewhat understaffed. Luckily it was petty quiet – if it had been busier, then they really would have struggled. In short, this is a site with lots of useful facilities for truckers, and a mass of parking. It has all you need, although the fuel was a good 10p a litre more – at £1.37 for diesel – than anywhere else nearby and indeed later in my day I saw diesel for £1.18, which shows what a mark up these places can make. But there is plenty of room for parking, the charges for which are comparable with many other truckstops, and the site looks to be relatively secure, although I cannot vouch for that. Being opened 24/7 is a big boost, and you can get something to eat, have a shower or use the facilities at any time of any day, which is of great use to truckers. In short, this is a place where you pay for the extra facilities.